(1) What are the derived characters of the postcranium that characterize the most recent common ancestor of the primates? (2) What are the functional and biological role attributes of these characters individually? (3) Do the functional/biological role attributes of the traits as a whole constitute a cohesive story? Can they be explained by a single selective factor or a set of selective factors arising from a particular way of life? (4) If primate synapomorphies cannot be attributed to a single way of life, does the evidence suggest an order in which characters were added to the morphotype, and thus a plausible functional/behavioral sequence? These questions raise many issues, the primary one being, of course, what does one mean by the phrase "Origin of Primates?" This topic is dealt with further at the end of this chapter, but for immediate clarification, the intention is to explain the behavioral significance of the set of features that characterize the Most Recent Common Ancestor (MRCA; Figure 1) of crown group primates. Crown group primates are the anthropoids, lemurs, tarsiers, adapids, and omomyids. There remain few serious challenges to the hypothesis that this group of mammals shared a common ancestor relative to other extant and fossil mammals. The derived features of the postcranium that distinguish this ancestor from the outgroup are given in Table 1. A formal phylogenetic analysis of the features is not given here since it seems fairly certain from both morphological and molecular evidence that primates are part of the Euarchonta (Springer et al., this volume), and for most of the features listed in Table 1, primates differ from any of the most likely outgroups (Scandentia, Dermoptera, Plesiadapiformes, Rodentia, Lagomorpha), as well as from the majority of other mammals. The few exceptions are noted in the text. Question 2 entails having a philosophy for formulating and evaluating hypotheses about functional and biological role in fossil organisms. This is discussed in the next section. (See also Szalay, this volume.) Questions 3 and 4 ask if the set of traits can be reasonably considered to be a correlated complex—can a single niche, habitus, or way of life explain all or most of them? The most comprehensive "single niche" model for the Origin of Primates is the "nocturnal visual predation" model (NVP) developed by Cartmill (1972; 1974a; 1974b). It explains the grasping extremities, loss of claws, and optical convergence of primates as being related to a way of life involving visually directed predation in the small branch niche by nocturnal animals. Figure 1. The most recent common ancestor (MRCA), is the common ancestor of the crown group primates, which include the adapids, omomyids, tarsiers, and anthropoids. It envisions a slow moving quadrupedal ancestor. 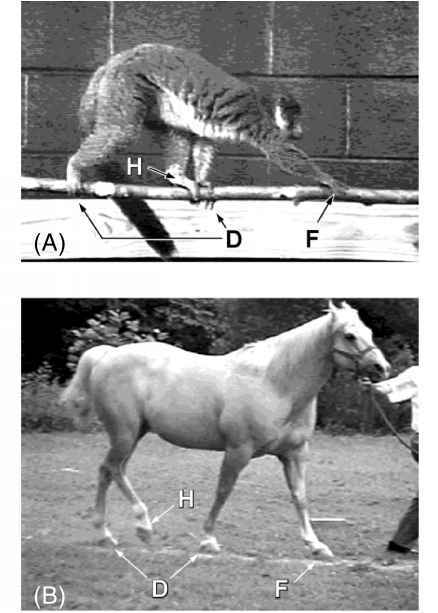 In contrast, the "grasp leaping" (GL) hypothesis of Szalay (Szalay and Dagosto, 1980; Szalay and Delson, 1979; this volume) proposes a more agile animal. The term was coined to recognize a unique category of positional behavior that is typical of many primates and thought to be ancestral for Primates. It includes both leaping and grasping as significant elements and thus distinguishes grasp-leapers from other "arboreal quadrupeds." It does not claim that behaviors other than leaping (i.e., quadrupedalism, climbing) are not used. It does not imply the specialized leaping of galagines, tarsiers, or indriids, which are placed in a separate, more derived locomotor category (vertical clinging and leaping). And, although it hypothesizes that primate limb morphology may be a compromise for the demands of grasping and leaping, it does not require tandem coevolution of grasping and leaping. The model presented by Szalay and Dagosto (1988; and later in this chapter) explicitly recognized the presence of a more primitive kind of grasping morphology and behavior in archontans prior to the MRCA. GL is somewhat more limited than NVP in that it simply seeks to describe a locomotor mode of the ancestor, and is not intended as a complete description of a way of life. It is compatible with, but does not require, the hypothesis of Clark (1959), Collins (1921), and Crompton (1995) that the visual acuity necessary for leaping and landing with the precision characteristic of nocturnal primates may have been an important factor in the development of orbital convergence. GL does not require, nor is it specifically linked to any dietary regime. The positional behavior elements of GL are similar to reconstructions of the ancestral primate offered by Martin (1972; 1990) and Crompton (1995).